Wow... what a response... so many of you were right on the nose with the color and then there were a few who needed a ...little ...more ..."help". Thank you all for taking the challenge. Congratulations to Janet Rattigan Riley, the winner of the tiny little "Snowy Landscape"! Janet, I will be in touch to make sure you receive this little gift. The answer? Yes, it is magenta. I accepted variations also... fuchsia, pink, and rose. Some of you might have noticed the hint which was that a few of the words had been written in bright pink. The next give-away will be in October... looking forward to seeing what comes out of the studio for the fall :-). My next show is Cape Elizabeth this Sunday. Set your GPS for Fort Williams and the Portland Headlight.... you won't be disappointed! Beautiful area, fine arts and crafts, crashing waves on rocks, in a lovely park that is being renovated by caring people. Have a fabulous weekend! 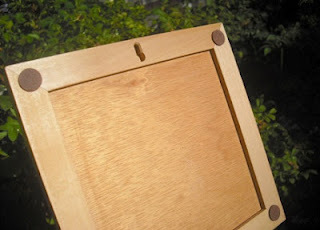 The last of four give-aways for August. The next series starts in October. This photo is of the tiny painting "Snowy Landscape" (it is a sticky warm day here today... so maybe this will be minor relief :-). 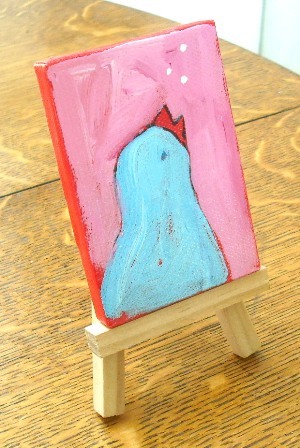 It is 2.5x3.5 inches. I will ship this to the winner which will be drawn this Friday, August 31 at noon. Here's the challenge: As many of you know, I start almost all of my paintings by spreading a color on the entire canvas first and then letting it dry before starting the actual painting. Question: What was that first color used in this painting? You may have to click on the photo to get a good look. All correct answers will go into "the hat". Post your answer here on the blog, OR send an email, OR get your name in the hat TWICE if you post a response on my facebook page "Rose Bryant Original Paintings". Good luck! I know you can do it :-). On the easel -"The Plum Tree"
Taking a little break from the color... still thinking about how this will end. 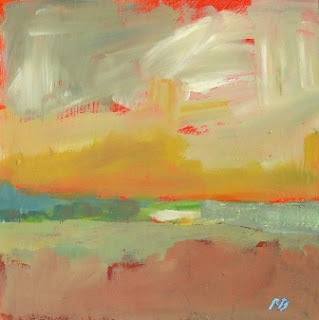 I will have this painting plus larger and smaller ones with me in Portland this weekend.... hope to see you there. The bluebirds sings a little song of happiness... she's knows she's going to make new friends soon. 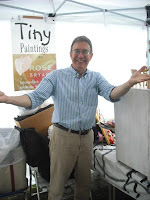 What is the next art show for Rose Bryant Original Paintings? Respond with your answer by email OR send me a message via facebook. All correct responses will go into the "art hat". The winner will be announced at noon on Friday, August 24. Good luck! Tell a friend who could use a little bluebird cheer. 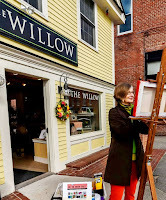 300 artists on Congress Street. Hope you can join me at my tent. I will be at Monument Square ... which is really super great because it is near the starting point (or the end ...depending on your outlook :-)). Everything is there... watercolor, oils, graphite, landscapes, still life, figurative, abstract... all sizes, all shapes ...everything. It's a big show so be sure and wear your comfy art-kicks. The show is near the Old Port and waterfront cafes. In the event of rain (Sunday is the rain date), check Portland WCSH 6 News at 6 and 11pm Friday evening. Good luck to all my artist friends... I may not be able to find you, so I will wish us all fair skies from here! So many great guesses... and obviously a lot of math brain cells were used. Congratulations to Colleen Kivley! You are the winner of this week's tiny Martini and Olive paintings. I will send you a note to connect. The answer, for all of you who responded, is "7". 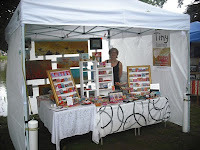 We have had seven yearly events here in the spring... we did the very first one in 2006. And what a transformation the event has taken over the years. The next drawing (tell your friends) will be posted on Monday and the drawing will be on Friday, August 24 at noon. Thank you for playing along and good luck! Martini and Olive Tiny Art Give-away This Friday! Ok... the SECOND of four give-aways is THIS Friday (August 17) at noon. The give-away is for TWO tiny paintings... one "martini glass" and one "olive". Just perfect for summer :-). To enter the random drawing, send an EMAIL to me with the answer to this question: How many Mother's Day Weekend yearly events have been held here on Union Street? HINT: a link at the top of this page will guide you. All correct answers will go into the "art hat" and a random pick will be made. Good luck! 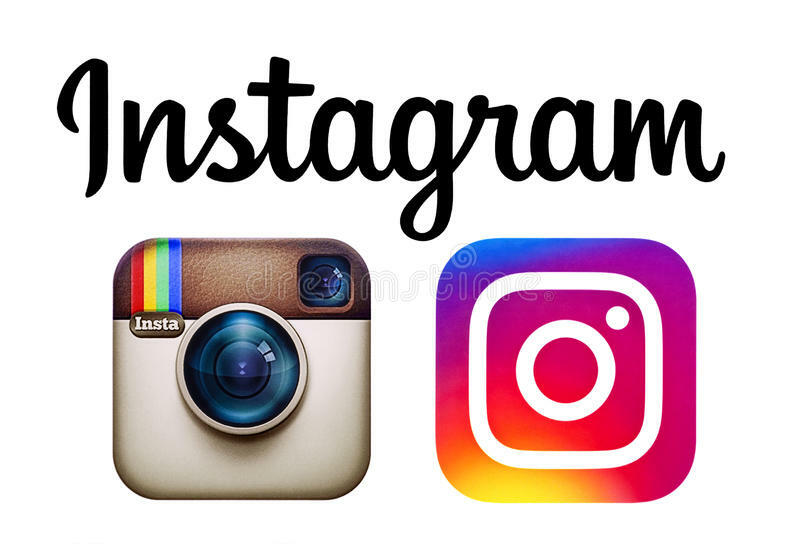 After this series of give-aways in August is done, the next 4 give-aways will be done in October and they will be through facebook... don't forget to go to the link to the left and "like" my Original Paintings page. 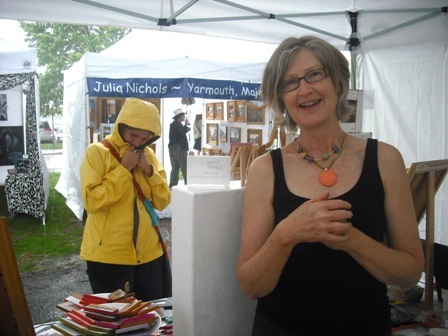 South Portland Art in the Park has been scheduled for SUNDAY, 9 am to 5pm. I will still be there at site #11 ....maybe wearing rubber boots. :-) Lovely day expected... plus the Portland area is a fabulous destination anytime. Hope to see you. First let me say... Boy you guys are good!!! There were so many REALLY close answers. All the names with at least one word correct went into the "hat". Congratulations to Jennifer Morriss, the random pick who also had one of the closest answers. The actual answer is "Red Sky in the Distance". Thank you all for playing... there were several that made me snicker. Look at this blog and on facebook on Monday for the next item up for grabs. Enjoy the weekend! Yes, it's that time again.... the first of four weeks of give-aways. This time, there is a challenge question. The names of all those who email me with a correct answer will go into the art hat for a random pick. 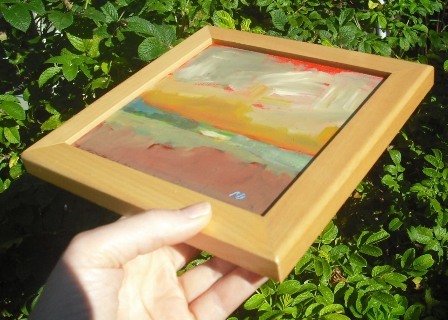 The gift is a 6x6 abstract landscape painted on board mounted in an wooden Ash frame. It is titled: " _ _ _ _ _ _ _ _ _ _ _ _ _ _ _ _ _ _ _" (five words). (hint: one word is a color). The more words you get correct, the better your chances are of winning. I will post the winner Friday, August 10, at noon. I will also ship. Good luck! South Portland. Mill Creek Park. 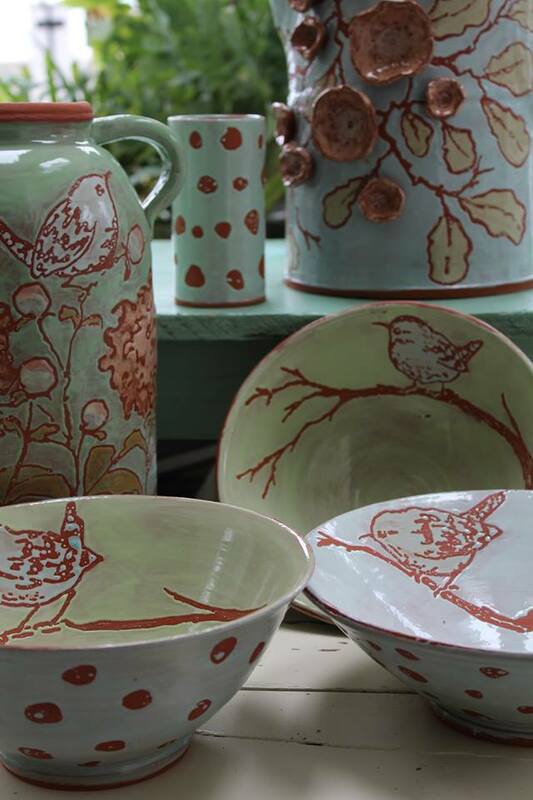 Saturday, August 11, 9-5. One of my favorite places to do an art show. 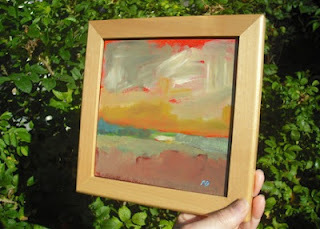 I will have even more art with me this year... the tiny paintings plus several larger works. The show is just over the Casco Bay Bridge in South Portland. While you are here, you can find a lovely cafe in town or a spot beside the bay... you can't go wrong in the Portland area :-). Hope to see you at Art in the Park.